Today I bring to you a list that I had a lot of fun doing: top desserts around the Durham Region. If you have a sweet tooth, this is the list for you - cheat days ahead! I hope that you enjoy reading this blog as much as I enjoyed trying the different desserts, because needless to say every spot on this list is most definitely worth trying. I will also list the cost of everything so you can have a better idea of price point. Let’s begin! 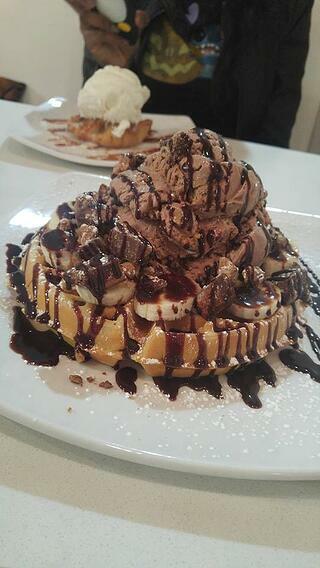 Spin Dessert Café & Bistro is located at 1355 Kingston Road, Pickering and is attached to the Pickering Town Centre! As a student taking a bus from campus, you would want to grab the 401 Simcoe south, and then catch the 900 pulse westbound, there is a stop right in front of the Pickering Town Centre. They do offer breakfast and other meals, but obviously, I went in just for dessert. For sweet stuff, they offer all kinds of cakes, pastries, milkshakes and waffles. I opted for one of the waffles, and needless to say, I clearly made a good choice, as you can see by that glorious photo. The waffle I chose is called ‘I Like It Like That’ and was well-named because I most definitely did! A thick Belgian waffle with chocolate peanut butter ice cream topped with Reese’s Mini Cup pieces, bananas, and hot fudge sauce drizzled all over the place, this thing was massive. I mean, I love food and it was huge for me. The bonus was that not only was it big, it was also delicious. I love peanut butter and banana, and this dessert took that combination to a whole new level. The ice cream fuses with the Reese's Mini Cups and banana slices creating a medley of chocolate peanut butter heaven, all atop a Belgian waffle. The waffle was very good, which is important because you can have the greatest toppings in the world, but you need the base to complete it! The other dessert pictured in the background is an Apple Blossom, served with vanilla ice cream. Basically a mini apple pie! I would definitely go back, as there are tons of other waffle combinations I'd like to try. Price: $12.25 plus tax for the waffle, $10.25 plus tax for the apple blossom. Like what you're reading? 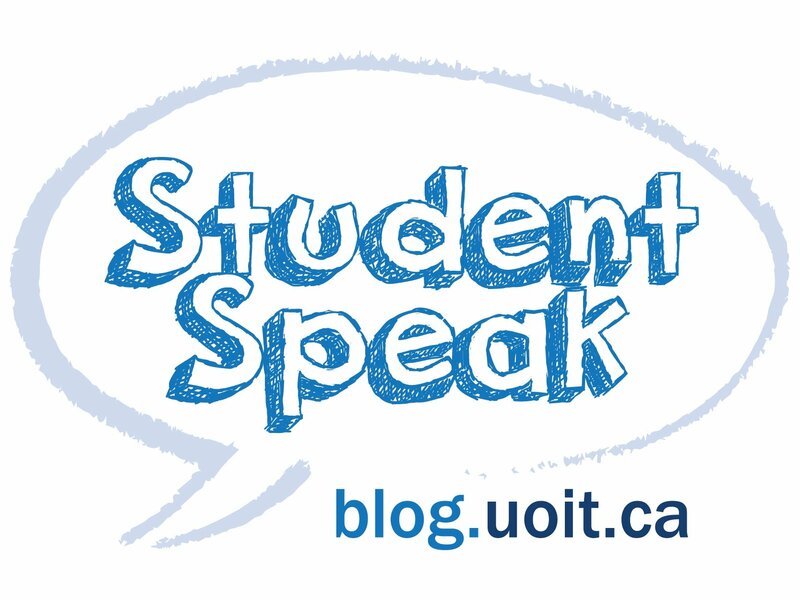 Follow Student Speak on Twitter to stay updated on all our blogs! Felicio’s Cake Boutique is a local, family-run business located at 65 Albert Street, Oshawa. It's just only a minute or two walk south of Athol on Albert. For students, if you bus as if you are going to the downtown campus (401 Simcoe south) you can walk from the bus stop to Felicio’s in a few minutes. They are both a cake shop and café, and boy do they make delicious cakes! I will be honest, despite frequenting them many times as a downtown student at UOIT, I've never tried the food, but if it's anything like the desserts it must be delicious as well. All ingredients used in their food are fresh, natural and many imported from Brazil. The quality is definitely reflected in the taste! I opted for their cake-in-a-cup, which gives you the added benefit of delicious cake-on-the-go portability. I went with a Dulce de Leche cake and the breakdown of this dessert is decadent: a layer of cake, layer of Dulce de Leche, layer of cake, one more layer of Dulce de leche again and then topped with white chocolate flakes. If that description did not immediately make you want a cake-in-a-cup, just wait until you see it with your own eyes! It is a deceptively large amount of cake too, I actually ate it in two sittings, and the second time eating it was just as good, if not better than the first! They have a variety of other cake-in-a-cup flavours as well, including chocolate, vanilla, strawberry shortcake, and more. Not to mention, if you wanted an entire, full-sized cake, Felicio’s can make that happen too! 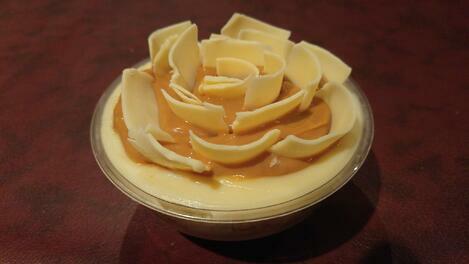 Felicio’s Cake Boutique is a great local dessert spot that I would recommend to anyone. Caffe Demetre is located at 75 Consumers Drive in Whitby. For an easier reference, it's located in the Landmark Cinema plaza and is right across from the theatre itself. Demetre’s does have a few locations across the GTA, but I visited the Whitby one, which is the only location in Durham. Demetre’s has been a staple in Whitby for years and I remember it being there back when Landmark was known as AMC. 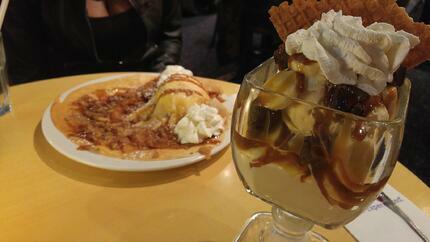 They have a large variety of desserts, mainly with ice cream such sundaes, crepes, waffles, cones, and more. They also offer many seasonal foods, such as a lot of strawberry options in the summer, or browned butter caramel in the fall. Their ice cream is premium, locally made in Toronto, and they have fresh fruit delivered daily. The quality is most definitely reflected in the taste. I opted for a sundae, and I chose the ‘Don’t Let Me Brown’, a seasonal offering which had browned butter caramel ice cream, with sliced bananas, butter caramel sauce, and brownies. It was delicious! The ice cream had a great caramel flavour and, as stated before, I love bananas so the combination of caramel and bananas was heavenly. Brownies being thrown in as an addition was great, because there’s really no dessert that brownies cannot be added to. The other dessert pictured in the photo is called the ‘Pomme Pilot’, and it was served on a crepe. This dessert includes white chocolate silk ice cream, warm apple crisp, with a butter caramel sauce and cinnamon streusel. I did try a little bit and it was basically an apple pie crepe! Both desserts were also large portions, which is always a plus. Caffe Demetre is a staple of Whitby, and definitely worth trying! Cupcake Junkie is a local dessert cafe located at 404 Brock Street S. in Whitby. It is just north of the highway exit on your left-hand side. If you are taking transit from campus, you would take the Taunton 915 to Brock Street, then the Brock 302 south. Cupcake Junkie is a local establishment that strives to sell the very best cupcakes, treats, and sandwiches, all with a mission to make people happy. They also make all their sandwiches and desserts fresh daily using all-natural, quality ingredients. As their namesake, they have a large variety of cupcakes ranging from the classics such as chocolate or vanilla to more creative options such as maple bacon, and cherry cheesecake. The current flavour of the month is ‘Pumpkin Pie is No Lie’ which is a pumpkin cupcake with icing and a small pumpkin pie on top! Despite their amazing cupcakes, I decided instead to try their cookie sandwiches with ice cream! 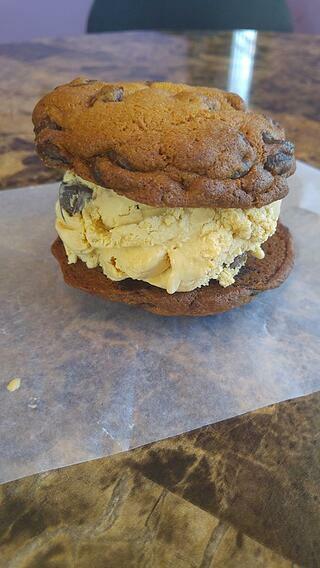 I'm not sure if there is any other way to put it, but I got the most delicious ice cream cookie sandwich ever. They call them ‘Happiness Sandwiches’ at Cupcake Junkie, and that is most definitely an accurate name. With Kawartha Dairy ice cream of your choice wedged between two freshly made chocolate chip cookies, this dessert basically screams delicious at you! I opted for salty caramel truffle ice cream (can you see I like caramel yet?) which is a caramel ice cream infused with sea salt featuring milk chocolate truffles with a caramel center. As you can imagine, this glorious ice cream scooped between two cookies was almost too much to handle, I was planning to have a cupcake afterward but the Happiness Sandwich was more than enough! They also sell Kawartha Dairy ice cream by the 1.5L tub, so that you never have to go without delicious ice cream goodness again. Hollywood Cone is located at 1 Simcoe Street N. in Oshawa. They are right at the corner of King Street and Simcoe Street. 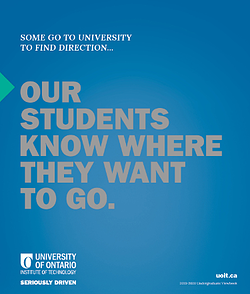 If you are a student, bus downtown as if you are going to the downtown campus (Simcoe 401), and you will see Hollywood Cone as you walk east on King Street towards Regent Theatre. Hollywood Cone is a Hollywood themed dessert place, with their menu and design following the theme of movies. Some dessert examples are the Chief Wiggum shake, styled after Chief Wiggum from the Simpsons (vanilla ice cream with coffee, and two pink-frosted sprinkle donuts) or ‘Pie Hard’, which is obviously a play on Die Hard. They offer regular milkshakes, cones, banana splits, but their novelty is the mutant shakes, which are massive milkshakes topped with more dessert! I split a mutant shake with a friend, and, warning, they are gigantic and are in no way meant to be finished by one person, but if you feel up to the challenge give it a shot! 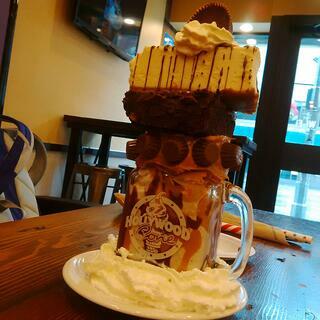 The mutant shake was called ‘Cloud Nine’ and it had a vanilla shake with Reese's Cups, cheesecake pieces, brownie pieces, Belgian chocolate and Reese drizzle. This milkshake was then topped with a slathering of peanut butter on the rim and finished with mini Reese cups stuck on the peanut butter, one big brownie, a slice of cheesecake, one regular-sized Reese's Cup, whipped cream, and Belgian chocolate sauce. As you can see by that description the mutant shakes are monsters, but they are delicious. They are huge, and definitely not meant to be finished by one person. There is a ton of milkshake, and the toppings are almost a dessert on their own, given it’s a full slice of cheesecake and a full brownie. I would definitely recommend trying a mutant shake, just remember that you will want to split it with a friend! I hope you all enjoyed reading about these delicious dessert spots as much as I did trying them! 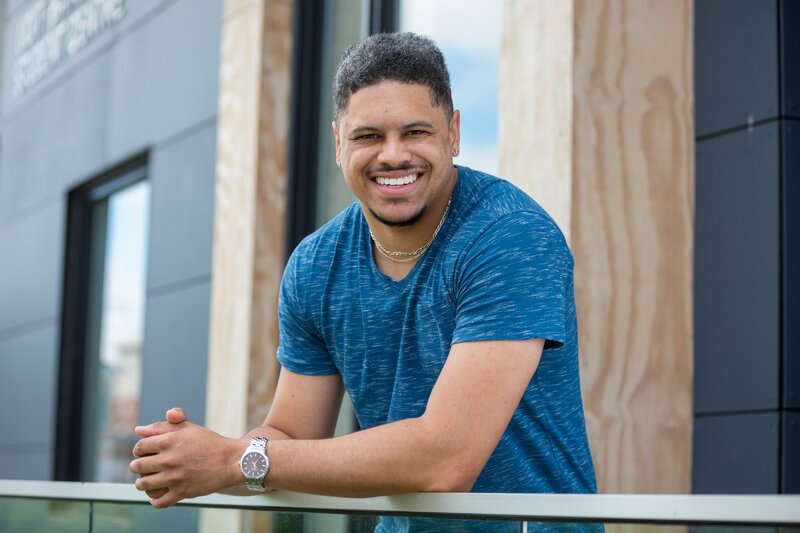 Leave a comment below on your favourite spot or if I missed a location. May this list present to you a delicious dessert to try, and I hope it meets your expectations. Until the next blog!